Place : Piyali (72 km from Kolkata by road), West Bengal, in the eastern part of India. Major Attractions : Royal Bengal Tiger, Ridley Sea Turtle. Area Covered : 1330.10 sq-km. Ideal Time to Visit the Park : During the months of September and May. Winter is the time to see the Royal Bengal Tiger sun-bathing on the river banks. Nearest Attractions : The Sajnakhali Sanctuary (famous for its rich avian population), Netidhopani (ruins of a 400 year old temple), Bhagabatpur, Kanak, Haliday Island, Piyali, Kaikhali Island. Some Major Accesses : Gosaba (50-kms), Kolkata. The Sundarbans National Park lies in the south-east of Kolkata in the 24-Paraganas District of West Bengal and forms part of the Gangetic Delta, which borders on the Bay of Bengal. The vast swampy delta of the two great Indian rivers, Brahamaputra and the Ganges stretches over areas consisting of mangrove forests, swamps and forest island all knotted in a network of small rivers and streams. The Sundarbans National Park in West Bengal is home of the Royal Bengal Tiger and is also the largest mangrove forest in the world, forming the core of this region. The Sundarban region has derived its name from the Sundari trees, once found in large number here. The Sundarbans National Park was established as a national park on 4 May 1984. 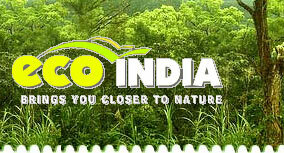 Before this it was been declared as a wildlife sanctuary in the year 1977. It was been designated as the core area of Sundarbans Tiger Reserve in December 1973. 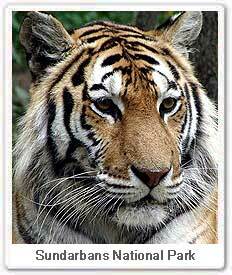 Sunderbans National Park was inscribed on the World Heritage List in year 1985. The area that makes up the Sunderban National Park is the largest estuarine mangrove forest in the world. With the altitude averaging at 7.5 m above sea level, there is hardly any highland variation throughout the park at the Sundarbans. The park is dotted with 54 small islands that are networked by many tributaries of the mighty rivers Ganga and Brahmaputra, which finally flow out at the southern tip into the Bay of Bengal. The main forest cover in the Sunderbans comprises of estuarine mangrove forests intermixed by swamp and littoral forests. There is mangrove scrub forest, salt water mixed forest, brackish water mixed forest and alluvial grasslands. Due to the dense and huge forest reserve, Sundarbans has also been classified as a World Biosphere Reserve. Some of the more commonly found plants and trees in the park are Genwa, Dhundal, Passur, Garjan, Kankra and Goran. The Sundarbans forest is home to more than 400 tigers. The Royal Bengal Tigers have adapted themselves very well to the saline and aqua surroundings and are extremely good swimmers. The animal number of the Sundarbans is quite varied keeping it's climatic conditions in mind. Apart from the Royal Bengal Tiger, Sundarbans houses - Fishing Cats, Macaques, Wild Boar, Common Grey Mongoose, Fox, Jungle Cat, Flying Fox, Indian Pangolin, Chitals, etc. Due to climatic conditions popular at the park, it creates an ideal habitat for the native as well as migratory birds of a numerous variety. Some of the more popular birds found in this region are - Open Billed Storks, White Ibis, Water Hens, Coots, Pheasant Tailed Jacanas, Pariah Kites, Brahminy Kites, Marsh Harriers, Swamp Partridges, Red Jungle Fowls, Spotted Doves, Common Mynahs, Jungle Crows, Jungle Babblers, Cotton Teals, Herring Gulls, Caspian Terns, Gray Herons, Brahminy Ducks, Spotted Billed Pelicans, Large Egrets, Night Herons, Common Snipes, Wood Sandpipers, Green Pigeons, Rose Ringed Parakeets, Paradise Flycatchers, Cormorants, Fishing Eagles, White Bellied Sea Eagles, Seaguls, Common Kingfishers, Peregrine falcons, Woodpeckers, Whimprels, Black-Tailed Godwits, Little Stints, Eastern Knots, Curlews, Golden Plovers, Pintails, White Eyed Pochards and Whistling Teals. Some of the fish and amphibians found in the parks are Saw Fish, Butter Fish, Electric Rays, Silver Carp, Star Fish, Common Carp, Crabs, Prawn, Shrimps, gangetic Dolphins, Skipping Frogs, Common Toads and Tree Frogs. The best and only means of travelling the park is to hire a boat and float down the various lanes formed by the many flowing rivers. 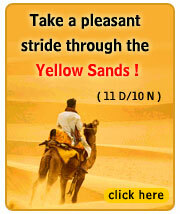 Either hire one, which is operated by the locals in the area or one of the two luxury launches - M.V. Chitrarekha and M.V. Madhukar, operated by the tourism department. The M.V. Chitrarekha offers all the basic facilities required by the tourists, including overnight accommodation. The local boats are available at Canning, Gosaba and Basanti whereas the luxury launches starts their journey only from Canning. Air : The nearest airport is Kolkata, at 112 km. Rail : Canning is nearest railhead, at a distance of 48 km. Road : Road transportation is available from Kolkata for Namkhana (105-kms), Sonakhali (100-kms), Raidighi (76-kms), Canning (64-kms), and Najat (92-kms), which are all near the Sunderbans and have access to the riverine waterways. Water : Sundarbans are approachable only by riverrine waterways. Motor launch facilitiy are available from Namkhana - Bhagabatpur Crocodile Project- Sagar Island -Jambudwip; from Sajnekhali - Sudhanyakhali-Buridabri- Netidhopan-Holiday Island; from Sonakhali - Gosaba; from Raidighi - Kalas.